heavily maintained prior to the beginning of natural succession. Same view 10 years later in 1992 (below). 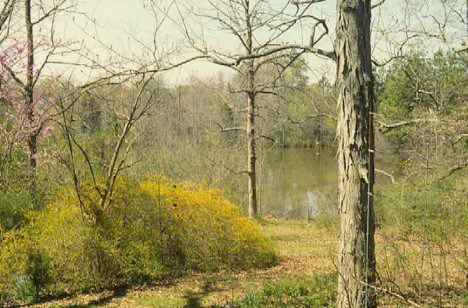 As is typical of the Carolina Piedmont, the land that is now Hilton Pond Center for Piedmont Natural History was affected heavily by agricultural practices. When the property was purchased in 1982, it had been under cultivation or cattle grazing for at least 65 years, perhaps much longer. Hilton Pond itself, a 1.5-acre impoundment, was installed in about 1960, as was a larger pond just downstream that lies partly on the property. By 1982, most of the 11-acre tract had been out of agricultural use for at least three years, and old field succession had begun on the areas away from the lawn area of the primary residence. Scattered throughout the property were a few large Eastern Red Cedars (Juniperus virginiana) and Loblolly Pines (Pinus taeda), and some mature hardwoods--including Pecans (Carya illinoinensis), Flowering Dogwoods (Cornus florida), a massive 150-year-old White Oak (Quercus alba), and other species. In a planned policy of "management by benign neglect," the 11 acres has been allowed to continue into succession--except for a small lawn at the residence and nearly two miles of nature trails that meander through the property. These trails, an intimate 38" wide, are maintained year-round with a riding mower and serve in many cases as lanes for mist nets used in bird banding research. Trails also allow access to all major habitat types at Hilton Pond Center. As the old fields lay fallow, they were colonized quickly by Broomsedge (Andropogon virginicus), Goldenrod (Solidago spp. ), False Boneset (Kuhnia eupatorioides), and Grounsel-Bush (Baccharis halimifolia), and by a pernicious invasive, Japanese Honeysuckle (Lonicera japonica). These soon were followed by seedlings from three trees characteristically found together in this part of the Carolina Piedmont: Sweetgum (Liquidambar styraciflua), Winged Elm (Ulmus alata), and Eastern Red Cedar. 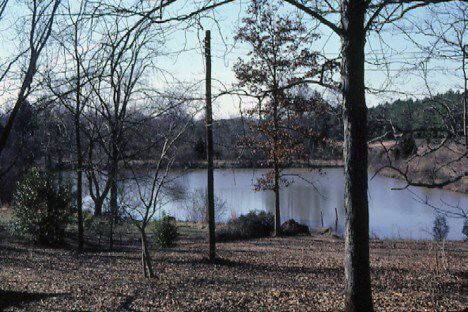 They were accompanied by Loblolly Pine, primarily because the Hilton Pond property was adjoined to the northwest by a 60-acre tree plantation that provided wind-borne seeds. Over the past 20-plus years, the species above--and many others--have turned Hilton Pond Center from open farmland to a new-growth upland forest with a strong mix of hardwoods and conifers. Observers continue to add to a Floral Inventory that already includes 50 tree species, 27 shrubs, 18 vines, 46 herbaceous flowering plants, three aquatics, and five ferns--plus numerous unidentified species of mosses, fungi, lichens, and grasses. There is also an ever-growing Faunal Inventory that includes birds (170 species sighted, 124 species banded), 27 mammals, 19 reptiles, 11 amphibians, and four fishes--plus countless species of invertebrates such as insects, other miscellaneous arthropods, and mollusks. In 1997, a policy was established to systematically eradicate foreign invasive plants from the property, especially plentiful shrubs such as Japanese Privet (Ligustrum japonicum), Russian Olive (Eleagnus angustifolia), and Multiflora Rose (Rosa multiflora). Mechanical removal (cutting) of these species has eliminated most thickety areas but has allowed increased growth by native trees, shrubs, and herbaceous plants. This section will contain photos of vegetational succession at Hilton Pond Center, as well as additional information about species changes.